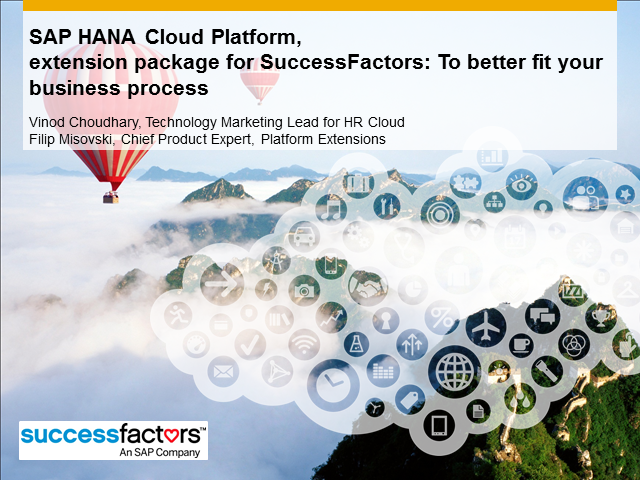 Find out how you can use SAP HANA Cloud Platform to extend SuccessFactors, the leading provider of cloud-based business execution software. SuccessFactors, an SAP company, delivers business alignment, team execution, people performance, and learning management solutions to organizations of all sizes across more than 60 industries. SAP HANA Cloud Platform is the industry’s only in-memory cloud platform. Built on SAP HANA and with comprehensive Application and Database services, this full featured, open standards based platform enables the real time applications required to succeed in today’s always-on, mobile, social and data driven world. SAP HANA Cloud Platform and SAP HANA Enterprise Cloud have generated significant attention in recent months. Please join us for an an introduction to both solutions, and an overview of the SAP cloud portfolio overall. We'll update you on 2014 announcements, discuss distinctions between the two solutions, answer your questions and more. Find out how you can integrate and extend your applications with the SAP HANA Cloud Platform, the industry’s only in-memory cloud platform. Built on SAP HANA and with comprehensive Application and Database services, this full featured, open standards based platform enables the real time applications required to succeed in today’s always-on, mobile, social and data driven world. The SAP HANA Cloud Platform offers developers several easy entry points for focused HANA or JAVA development. Find out how you can use the SAP HANA Cloud Platform to rapidly build cloud scale enterprise class applications that unlock new possibilities for your business in this comprehensive webinar. We hope you'll join us for an overview of SAP HANA Cloud Platform, the industry's only in-memory cloud platform. Built on SAP HANA and with comprehensive Application and Database services, this full featured, open standards based platform enables the real time applications required to succeed in today's always-on, mobile, social and data driven world. What is SAP HANA Cloud Platform?